You may remember Jenin from the siege there, after Israelis found bomb belt factor after bomb belt factory, Islamic terrorist after Islamic terrorist in Jenin. The place is chock full of ’em. During the siege, the many Islamic terrorism supporters and Jew-haters who live there, lied and claimed that Israeli soldiers murdered 500 people. But even anti-Israel United Nations investigators concluded it was all a lie. Fiction. The less than 30 people who actually died in Jenin at the time died of natural causes, unrelated causes, and some died at the hands of other Palestinians. 60-65 percent of cucumbers consumed in Israel are grown in the Jenin area of the West Bank. Nearly 17,000 tons of cucumbers are harvested in Northern Samaria and delivered to Israel, providing economic sustenance for close to 3,000 families in Jenin. The cucumbers are picked during the day and delivered to Israel in the evening. 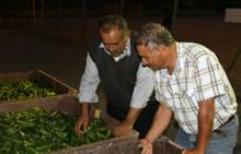 If you wait, explains cucumber grower Adnan Abu-Ali, the cucumbers lose weight during the night. A truck carrying 15,000 kilos of cucumbers would overnight become a truck carrying 14,500 kilos – representing a loss of 1,500 shekels. The Gilboa Crossing between Israel and the northern West Bank usually operates from 8 a.m. in the morning to 5 p.m. in the evening. But recently (and in the weeks ahead), the crossing has remained open as the sun sets for the transfer of cucumbers. 250-300 tons pass over the course of three hours. If additional time is needed, there is no limit. Yeah, how many of those 3,000 Palestinian Muslim families would kill every Jew eating their cucumbers if they had the chance? A conservative estimate is 2,999.67. They hate the Jews and yet they would be destitute without 100% Jewish customers. Muadi said that one of the missions of the Civil Administration is to care for and develop the Palestinian economy. Liar. Almost every single homicide bomber caught by Israeli soldiers in the last decade came from wealthy families and were working, making a good living. It’s not about economics. It’s about Jew-hating. And hating anyone who isn’t Muslim. Muadi added that another mission of the Civil Administration is to protect public health, both among Israelis and Palestinians. He said that all produce imported to Israel is inspected by agronomists. Yeah, good luck with that. They can’t inspect every cucumber in the thousands of tons. And they can’t easily detect many of the possible viruses, like the one in Germany. Stupid Jews in Israel give their enemy the rope to hang them with. We know the Palestinian Arabs would never promote or market Israeli products abroad. I’ll never understand why the Israeli government insists upon subsidizing those who hate Jews and wish to destroy Israel. Here the Jews go again trying to show their niceness towards those who would kill them given the chance. And no it will never bring peace to the Middle East! So much for the “kosher pickle” business. I find it interesting that people who don’t visit Israel are so ignorant of the degree to which Jews and Arabs mix in that country. To get it from the mainstream news media, you’d think the Arabs spend all their time trying to suicide bomb Jews; you’d think that Jews spend all their time whuppin’ on Arabs. It takes a visit to Israel to experience how strangely normal it actually is. That being said, Debbie has an important point. The Arabs are fanatics. For too many years, Israel’s left has thought that their friendship can be bought with economic prosperity. It’s never worked. To the extent that it ever worked for any period of time, economic prosperity always has its “ups and downs”. When times get tough, you know who the Arabs blame. At the end of the day, this article could not have been written had the Israelis not built the fence. The only way this cucumber business came about was by caging in the cold-blooded animals and feeding them like crocodiles in the zoo. Keep ’em caged up. There’s no doubt in my mind what will happen if we let ’em out. The Israelis get stupider and stupider. If every one of the cucumbers was poisoned, so many thousands of Israelis could die. I also must point out that I have a patent attorney friend in Israel who farms about 135 acres. Even though he was paying a decent wage, he could not get Israelis to work on the farm. Now, I believe, foreign workers work on the farm. The Israelis have grown a welfare state to large for their own good. Not every Israeli is a scientist or soldiers. It is time for Israel to get back to basics: Grow your own food. Green the desert. Expand your industries. Manufacture your own weapons (as much as possible). Keep the Sabbath holy and the practice the Jewish law. Study the sciences. Kill your enemies before they kill you. Israel should completely disengage from the Arabs. My view is, give the Arabs what they want and let them take care of themselves. Israel is not obligated to provide them with a living. The Palestinian Arabs are rotten spoiled and don’t appreciate anything because they have Israel and the world waiting on them hand and foot. If that changed, no they still wouldn’t love the Jews but they would treat them with respect. No charity case is going to respect their benefactors. Its only human nature. There will come a time again when Jews and Arabs will have respectful relations but they never have and there will never be love between them. 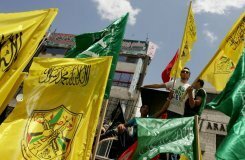 The Israelis aren’t going to totally dis-engage from the Arabs. One quick trip to Israeli should end any notion of that. I also don’t think the Arab farmers are going to poison cucumbers shipped to Israel. That might not stop others from tampering with the produce, but the farmers are unlikely to be the ones to do it. What’s kind of sad is that ultimately, those Arab farmers growing the cucumbers will one day be assassinated for “collaborating with the Zionists”. That is because Arabs are led by fanatics. Well… it looks like at least the Arabs can grow some produce. Nuthin’ too big, but it’s a start. While Israel need not totally dis-engage from the Arabs, you have one very important point. The Arabs need to start “making stuff” if they’re ever going to have viable nations. Heck! That’s the Arabs’ whole problem in a nutshell: they don’t make stuff. Sure, the Saudis have oil, but they can’t find it, drill it, pipe it and transport it themselves. They just sit on their asses and claim sovereignty. Dhimmi Americans and Europeans do all the heavy lifting to get the oil to market. That’s why every time foreigners are kidnapped and/or killed in oil producing nations, the spot market reacts upward. Compare that to Israel. Israelis make stuff. With a population 1/4 that of Saudi Arabia, Israel’s GDP is roughly half of Saudi Arabia’s and that’s done without oil exports. Imagine that! Here’s another one that should tickle your fancy. Libya has a population approximately the same as Israel’s. Libya has a large land mass. Libya is an OPEC producing nation. Yet with all that, Libya’s GDP, oil included, is less than HALF; almost 1/3 of Israel’s. That was before civil war broke out. So if the richest Arab nations can’t “make stuff” it is no wonder their people are poor, miserable and easily taught to blame the Jews for their problems. It has always been thus. I’m not upset that Arab Palestinians are making cucumbers. They SHOULD make cucumbers; better cucumbers than suicide bomb belts. The problem is that their leaders are fanatics and once the local WB Arab economy down-cycles, the first ones to be blamed will be “the Jews”. Moreover, it needs to be repeated that prosperity in Arab lands does not erode the culture of anti-Semitic fanaticism that prevails in Arab cultures. Some Arabs will always reject this fanaticism and paranoid psychosis, but they’ll never confront it because doing so is hazardous to their health. BTW, you’d be surprised at the economic cooperation that goes on between Gaza and Israel. I’m not saying nice things about HAMAS or Gazans here. I’m just saying there’s a lot of cooperation that you aren’t aware of because the LIB media doesn’t want you to know about it. If you did, it would ruin their anti-Israel narrative they push day in and day out. I don’t like cucumbers, wherever they’re grown. I call them puke-cumbers. My wife likes them so she often has some in the fridge. I’ll put one of those little bio-hazard symbols on them. Is there anything else “Palestinian” sold here that I can have the privilege of not buying. I really came to like Israeli cukes on my recent visits. The closest I can find locally to the Israeli variety are the so-called “Persian Cucumbers” I get from Trader Joe’s (but they’re usually grown in Mexico). If I had more of a green thumb I might try growing them myself. I too find myself shaking my head as I watch Israel doing so much for her neighbors, offering gesture after gesture, kindness after kindness with hardly a trace of reciprocation. Part of the strategy I suspect is a recognition that, despite the delusions of the international community, peace is at least a generation away; so what they’re trying to do is simply manage it. Here’s another example: Water in that region is exceedingly precious, especially with six of the last seven years delivering below average rainfall. Israel has managed through the crisis by becoming the world leader in water reuse, raising prices to encourage conservation, and increasing its supply by desalinating sea water. The water tables and the Sea of Galilee (Kinneret) are still dropping. So what does Israel do? It provides from its own supplies water to Gaza, the West Bank and even parts of southern Lebanon (you know, Hizbullah country). It also provides more to Jordan than it is required by treaty. Now I learn they’re going to provide an additional 5-10 mcm at a price much lower than Israelis are paying. Israel’s neighbors are more reliant on Israel for their wellbeing than they will ever admit. It’s too bad Israel hasn’t managed to leverage that reliance on its own behalf. Israel’s leaders, a perfect example of the adage, “those kind to the cruel will be cruel to the kind.” For 44 years Israel’s successive leaders have allowed tens of thousands of innocent Israelis & visitors to Israel to lose their limbs, lives, & precious properties by not doing the only sensible thing, repatriate the hostile (extremely mildly put) populations left on Israel’s side of the border with Jordan & Egypt following the ’67 Six-day War. I hate pickles and/or cucumbers! Actually, I tried eating cucumbers when I was a kid, and they tasted good, but upset my stomach. I never did like pickles. Did you folks know that TODAY, Tuesday 14 June 2011, is the two hundred and thirty-sixth birthday of my beloved United States Army, AND it is also NATIONAL STRAWBERRY SHORTCAKE DAY!!! While shopping at Vince & Joes, an Italian market in Shelby Township,I grabbed a package of dates and flipped them over to check the price. The package said “Product of Iran” !! !